﻿ I've spent some time analysing in more detail the Transport for London 'screenline data' that shows the manual counts of vehicles passing over London's bridges. I profiled this last week here, when I showed that bicycles are now the majority of traffic passing over London's bridges northbound in the morning rush hour. I wanted to take a look at a couple of the bridges leading to the City of London in particular. First up, London Bridge. The number of bicycles crossing north from 7am - 10am has boomed from only 320 bicycles in 1990 to 1,545 in 2010. That's actually down sligthtly on 2008 when there were 1,770. By contrast, private cars are down from 2,158 to only 665 in the same period. It's worth noting that the number of taxis has stayed more or less constant in that period, with blips here and there. The change is more dramatic on Blackfriars Bridge, however. It's only a few years ago that this bridge had incredibly nasty bicycle lanes hovering down the middle of the northbound carriageway. If you can't remember just how grim this road used to be, have a look at these images here. Two cyclists were killed on these lanes in relatively short succession. The road was narrowed in 2006 and a relatively useful lane for bicycles introduced plus a permanent bus lane. In short, the bridge was literally a death trap. It's still got some nasty surprises (more on that below) but the changes have resulted in a massive swing towards cycling. There are now 1,926 bicycles a day heading north on this bridge in the rush-hour. That's up from 432 in 1990 and generally lethargic numbers right through to 2004 when things really started to change. Although, once again, it's interesting to note that taxi volumes are ever so slightly on an upward trend. 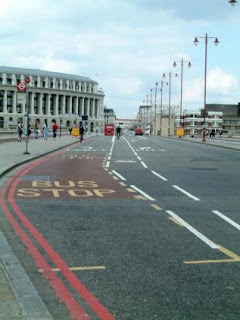 In any case, bicycles now comprise 35.6% of the total traffic on Blackfriars Bridge heading north in the mornings. That's more than any other mode of transport and higher than private motor cars and taxis combined (31.9%). On that basis, I still can't see why, when I'm cycling northbound, I should consistently be made to feel that cars have priority. They're bigger and faster than me. If I want to turn right, I need to be able to pace it in front of two lanes of traffic (taxis can clog up the bus lane quite happily) to get into the right hand lane. If I want to go straight on, I find the bicycle lane narrows to a strip that's no wider than my handle bars. And bear in mind, that on a typical green traffic light phase, there will be up to 40 bicycles squeezing through that tiny lane. 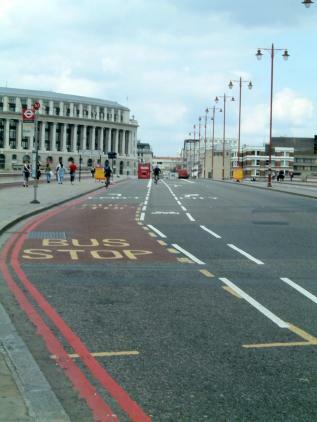 I remember the old cycle lane - I always wondered how anyone would have the nerve to use it, and I didn't start cycling over Blackfriars until it was gone. Although I recall at the time that not everyone was entirely happy with the revised layout, it did get quite a lot of support from cycle campaign groups and it certainly looks like it has achieved one tangible benefit (in conjunction with congestion charging, I guess) which is to cut the volume of traffic, particularly private cars, crossing the Thames here. Certainly, although non-authorised traffic now has to cope with one lane instead of three, serious tailbacks are rare and generally have their origins in some snarl-up further up the road. Cyclists emerging from the Waterloo direction can join the road just ahead of the pelican crossing by the pub, just inside the bus lane, which is largely respected by other vehicles, and quickly reach a reasonable 2 metre cycle lane as far as the lights on the north side. Shame then that it all falls apart from there - the Blackfriars construction works have squeezed the cycle lane round the bend where TfL have attempted to maintain two traffic lanes, neither of which is wide enough for buses/HGVs negotiating a tightish curve, and while going north into New Bridge St is not too bad, going East to Queen Vic St isn't nice. Also backs up the 'Safety in numbers' argument? I've been cycling the same route in London about once a month for 6 years now [St Pancras to Millbank via Blackfriars Brdge junction] and have been amazed at the change. I feel, if not in the ascendancy, at least no longer a loopy minority. Drivers show me at least a grudging respect, much more so than Leicester,where my journey starts. Does the data show the number of motorcycles crossing too? If so I'd be interested to hear if they have increased as well. Great post, keep the data coming, it is making for some very very compelling reading. I wonder if the people at the Corporation have seen this yet? @ericaonabike I don't think this does back up the safety in number argument. Although there are lots more cyclists, the data does not demonstrate whether they are any safer than the few who came before. The cycle KSI rate may well have also risen expedentially as well, in line with the %age increase of cyclists. What I think is worth also bearing in mind is that the bridges still don't exactly create environments which are inviting for cyclists - especially considering their number. Things have changed dramatically and the bridges are still much nicer places to be than before, but that is not to say they are yet nice places to be when riding a bike. @ibikelondon I think there is *some* merit to the "safety in numbers" argument - all other things being equal, more cyclists means that they are more visible and, presumably, drivers should be more aware of their presence. But like you say, we don't know whether the KSI figures have risen in line with the raw numbers, or fallen. What I do object to, however, is the "safety in numbers" argument being used as grounds for complacency. Instead, let's *build* on the gains on Blackfriars Bridge. Look at the numbers of people cycling across it - why shouldn't they get more of the space allocated to them? Surely those who make so much of the 'safety in numbers' argument should come up with the evidence to prove their case. We need to know how much safety improvement has been seen under what circumstances and for what increase in cyclist numbers. Otherwise it's just a meaningless campaign. Personally, I'm sceptical, I want to see the evidence. This is excellent stuff - the justification for building proper facilities is growing. Alternatively, you could just close the bridge to motor traffic for the peak hours (well, perhaps you could allow buses). One of those solutions is politically hard, one is very expensive. I've always felt that one of the real benefits of 'Safety in Numbers' lies in the subjective safety benefit from riding near other cyclists. Since 'subjective safety' is something that Hembrow bangs on about repeatedly, I'm not quite sure why he rejects it. Incident numbers remain similar throughout the period, cycle use has soared. Safety in numbers? Small numbers statistically, but the picture is the same everywhere in London. Unfortunately the south end of the bridge does already feature a ghastly narrow segregated cycle route (stupidly placed in the middle of the road). I've never seen anyone use it. How do we ensure that any new cycle paths are a) wide enough, b) in the right places? Was that meant as a response to me? Because if it was, it doesn't seem to support 'safety in numbers'. If anything the intervals are becoming shorter, which suggests more danger. But the numbers are too small. The burden of evidence lies with those who claim the effect. IIRC, subjective safety is notoriously hard to measure. But feeling safer doesn't mean being safer. But people who are minded to cycle but currently don't, but who feel safer will be more likely to cycle. I'd agree with @amoeba that the burden of evidence to support a 'safety in numbers' effect lies with those who believe it to be true, and such a claim can't be backed up with limited data numbers. But hair-splitting aside, what is interesting is that everyone here thinks that these figures really support the need to improve the conditions on the bridge for cyclists. Quite right! It wasn't a reply that I expected to be entirely fulfilling: as I say, 5 KSIs in 10 years isn't enough to be statistically significant (though it is almost enough to get you a speed camera!). But if you just look at those 5 in isolation your comment that 'the intervals are getting shorter' and 'more danger' are both incorrect. a) whichever way you cut the cake KSI rate is either stable or declining. A three year rolling average sees it at 0.7 KSI pa. The first 4 years saw 3 KSI, the last four 2, etc. It's hairsplitting, no doubt, but to say that danger is increasing is demonstrably untrue using the data available. What's more, the same is happening in many parts of London - KSIs stable or falling, cycle use shooting upwards. The latter is a fact ridiculously contested by some, but happily welcomed by others, including this excellent blog. BTW, there's plenty of evidence of safety in numbers - Vandenbulcke et al - (http://bit.ly/dst4mE) is probably the best. Indeed, everyone thinks better provision is in order: now, why was crappy segregation put in on the south side and how can it be stripped out and replaced with better stuff? "BTW, there's plenty of evidence of safety in numbers - Vandenbulcke et al - (http://bit.ly/dst4mE) is probably the best." I'd love to look at Vandenbulcke et al. unfortunately, your link points to a route on a map! So it does! Sorry about that. BTW, I don't think subjective safety is all that hard to measure. Copenhagen does it, as does London now. It requires surveying a decent enough samply and asking them how safe they feel cycling is. In Copenhagen the measure of subjective safety has fallen slightly over the last few years. In London it is very low in comparison to other modes (not a surprise! ).